During the last 2 years I had enough time to reflect on my practice. I came to the conclusion that the method of learning the asanas and vinyasas can be improved. It’s not enough and rather ineffective to hold an asana for five breaths only. If one wants to learn an asana one must do more than this. I use a timer. I hold several asanas for 1 minute these days. Today I practiced primary. I held marichyasana B for 1 minute as it’s a good preparation for one of the most difficult asanas of this series, which is supta kurmasana. I also held the twist marichyasana C for one minute to balance all the forward bending asanas and I held the headstand for 1 minute at the end of my practice. One minute can be rather long. Scientific research have found out that the body needs time to relax. 5 breaths is not enough, this can not be repeated often enough. When the body is relaxed stretching is possible. One must also hold the position for a while to make it last. It’s useful to look for external clues. The timer is an auditive external clue. It has much more authority than my inner voice that is counting. The timer is also more precise. Another external visual clue can be the wall. When I stretch I aim for reaching the wall. This will never be possible as the wall is so far away, but the thought alone helps to lengthen the body more than without this external clue. Stretch your body is less effective than trying to reach a wall that is far away, also when it’s only a thought. The timer also tells me when 90 minutes are over. I aim for a daily practice that lasts 90 minutes. It’s so much easier to have a time frame than to practice till all poses are done. It intensifies my practice.I have no orientation how late it got already when I practice. To look at a clock again and again is only distracting. To practice before breakfast is wonderful. The stomach must be empty in order to get deep into the twists. 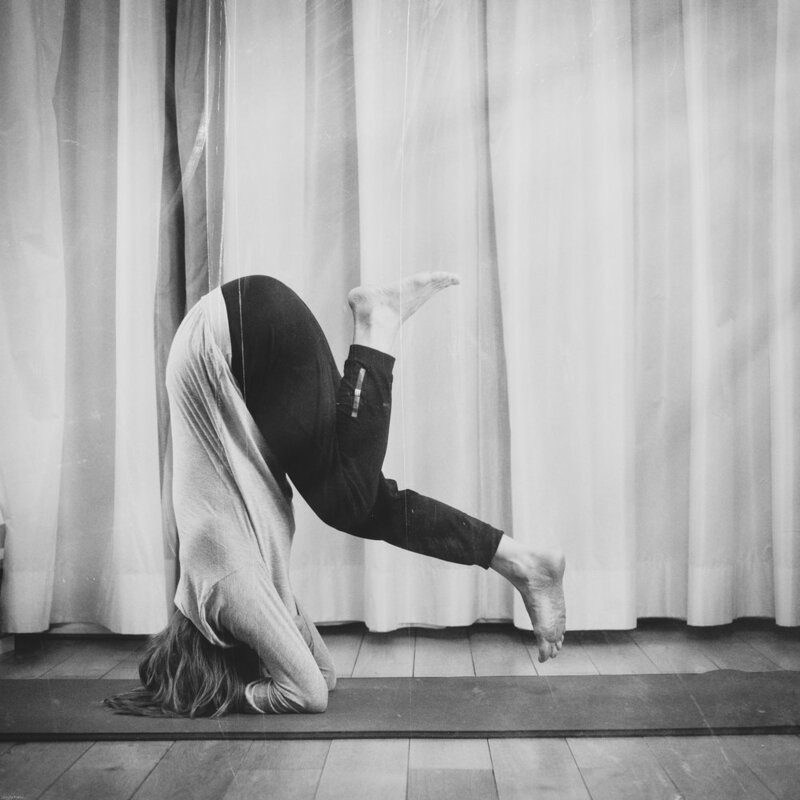 I want to hold a forward fold, a twist, my most difficult pose and headstand for 1 minute. The goal behind this goal is to get so used to be in asanas that one can finally enjoy these asanas. It must feel good to be in a pose. Breaths must flow easily. It would be good if the face is relaxed, too. If the pose looks as if it’s a piece of cake, if you can sleep in that pose, you’re there. Sharath Jois wrote a book. Of course I’m curious what’s his message. Sharath is a practitioner of Ashtanga yoga for decades. In addition he is a teacher with students around the globe. His focus in life is Ashtanga yoga. What does he want to tell the world? The subtitle of the book is ‘A yogi’s secrets to a long and healthy life’. I think both adjectives are important: long and healthy. Life needn’t to aggravate only because we become older. There are surely methods that make it more likely to stay healthy, but there is no guarantee. I like the book very much, even though I don’t agree with every aspect. It’s an inspiring book. I got surprised, too. Sharath writes a lot about food and eating. This is indeed issue # 1 for many of us. In our Western societies more than half of the population is overweight. This comes with illnesses. We don’t know anymore what and how to eat. Do not eat breakfast like a king. Eat one big meal a day, and make that lunch. Yes, yes, yes, I agree 100%. Yogis prepare their own meals. In order to eat healthy we have to. Restaurants don’t offer healthy food. Sharath goes so far, that he and his family also prepare their own food, when they travel. It’s perhaps possible when the chef accompanies you on your trips. For me this sounds not doable. Getting out, eating out is an opportunity to meet people when traveling. Nevertheless I love the idea. There are always alternatives. There are always improvements. I’ll surely not start eating with my hands. I’ll also not start drinking milk as it was the habit of P. Jois. It seems that also Sharath likes milk. His book gives a lot of opportunity to reflect on one’s own habits and to question them. Last but not least what we do on a daily basis must fit to the own life style. Sharath surprised me with his thoughts on walking barefoot and his thoughts on praying and social connectedness. There is also a relative short chapter on asanas. I don’t want to uncover too much. The book can be inspiring when reflecting on one’s own life off the mat. Being a yogi is a life style. Yogis sleep in a certain way, they get up early, they exercise being content. Living the life of a yogi might indeed help to get old and to get old healthy. It’s not an empty promise. I’ll keep this book in my library. I’ll surely get back to it. A week begins perfectly with a yoga practice. Habits make everything easier. To be honest, my habit to practice in the morning every day is medium strong. My goal is to practice every morning at the same time. Then it’s done and I’ve time for all the other activities. Seven o’clock could be a good time. I remember a time when I was at the mat at 6 am and I had to commute to a yoga studio. It should be doable to create a stricter schedule than it is now. It’s a life style that effects all parts of my life. It determines when I get up and when I go to bed. It determines what I eat. I’ve tried a few other life styles, too, but the life style of a yogi fits very well to me. I don’t think that I miss anything when I don’t go to parties till the early morning. I find it boring to sit in front of the TV too long. I prefer to be in bed early. I love minimalism. I miss the yogis and yogis, but I don’t want to give up my home practice. My yoga practice is adjusted to my needs. When I feel weak like today I do less vinyasa. On other days when I feel strong I add asanas and vinyasa and I challenge myself holding the asanas longer. I feel rather exhausted now, so it was enough what I did. The week has started. I’m looking forward to it. Tomorrow I’ll focus on back bending. Whenever an asana works on stretching body parts it’s good advice to have patience. It takes time to stretch. Being overambitious causes injuries. Injuries are setbacks. Sometimes indicating an asana might be enough. It’s better to establish again a daily yoga routine than to force the body into a position that is too demanding. Especially after a break one must take it easy. It is disappointing to lose asanas. As in life there are ups and downs. Knowing when to give 90 % and when not is something we learn over time. I wrote 90 % because we cannot give every day 100 %. I even read that sports people get to better results when they take it easy. To hold an asana longer than only 5 breaths will help to advance relatively fast. What is worth doing, is worth doing daily. To practice daily is so much better, than to have long and intensive practices once in a while. This might sound banal, but it’s true. 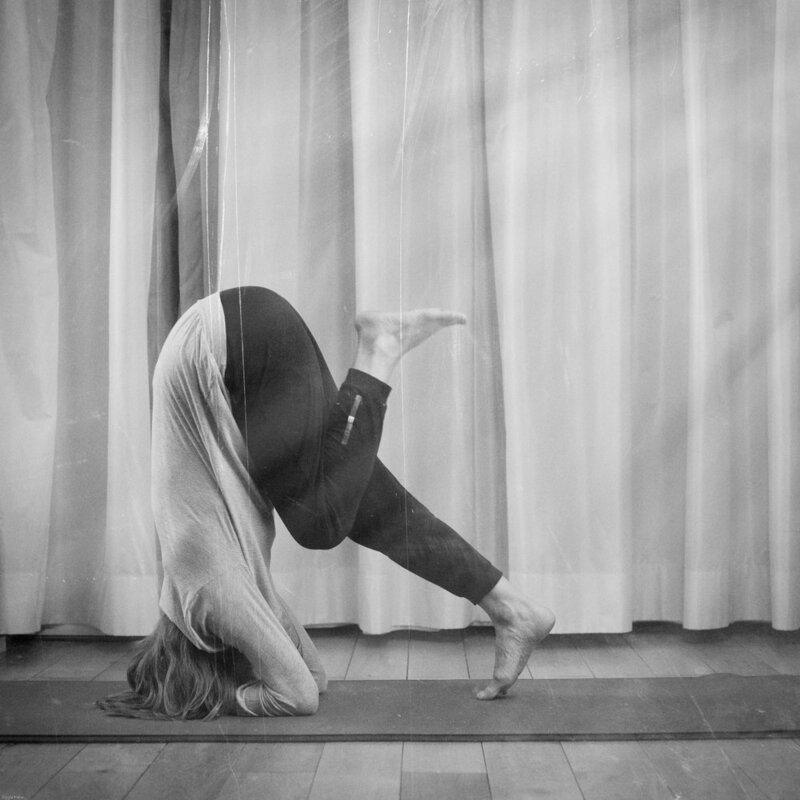 The above pose is called paschimottanasana and it’s the first pose of the middle part of Ashtanga yoga. There are four variations of this asana, with each asana one moves a bit deeper into the pose. When it’s possible to bind the hands in front of the feet, one can omit the other 3 variations. What sort of asana is it? Paschimottanasana is a forward bending asana. In this case it’s easy, but sometimes there are asanas which are a combination of forward bending and balancing i.e.. This asana stretches the back of the legs. 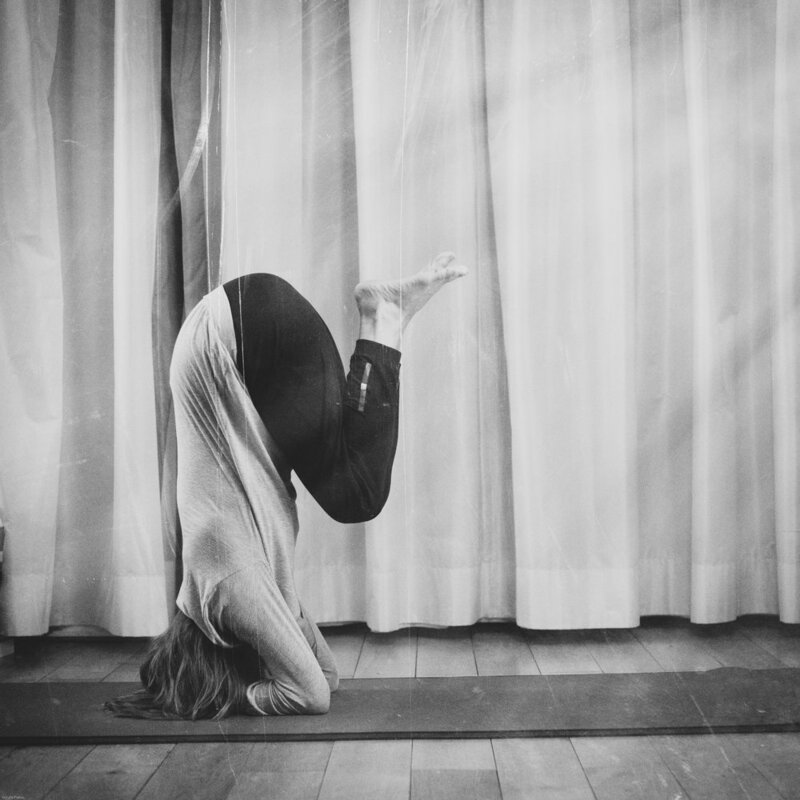 To stretch the body takes usually longer than to learn an asana that requires the correct technique like sirsasana (headstand). Are there easier variations? 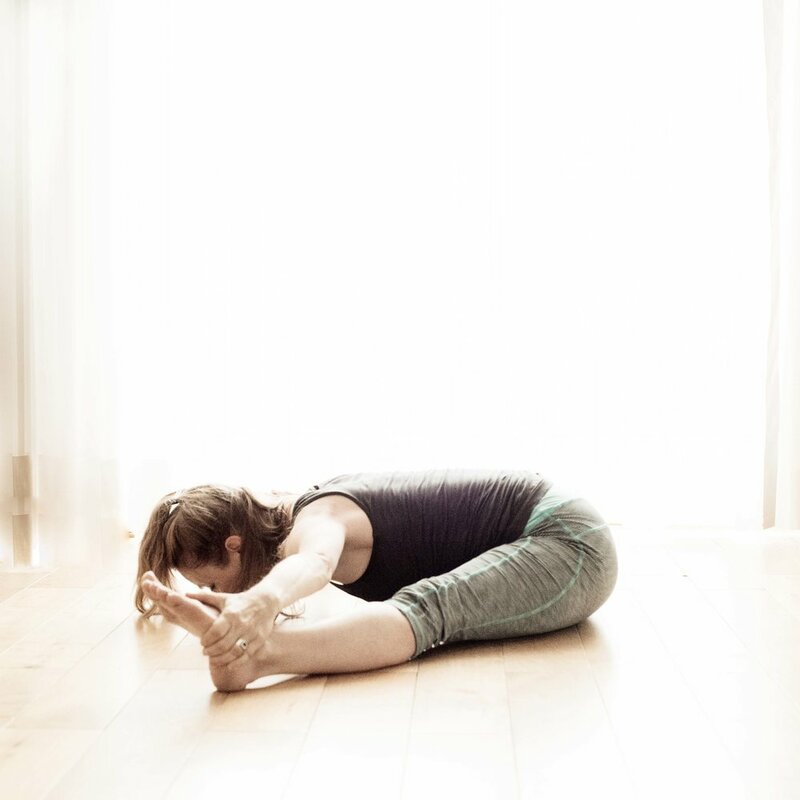 Paschimottanasana works mainly on the hip joint and on stretching the back of the legs. Knowing this one can come up with easier variations with the same goals. Are there more challenging variations? These days it’s easy to google the variations. The student must decide which variation he/she likes to add to the practice. Can I move the body 90 degree? Often an asana has the same form but is performed with a rotation of 90 degree. Instead of sitting, one can lie on the back with the same body position. This can make a huge difference. One can also stand and again the asana will feel totally differently. What is the counter asana? Very often it’s upward facing dog in primary series of Ashtanga yoga. Yet for paschimottanasana the next asana works as a counter pose: It’s purvottanasana. A counter pose moves the body in the other direction, but not that intensively. How to get into the asana and how to get out of the asana? In Ashtanga yoga this is called ‘vinyasa’. It’s the dynamic part. I prefer to work on the asanas than on the vinyasas. It’s surely good advice to give these two parts the same attention. Picture 1 shows an easier variation, picture 2 shows a variation with a rotation of 180 degree, picture 3 shows a vinyasa exercise and picture 4 shows a counter pose. No asana is a stand alone position. Around a single asanas are vinyasas and other asanas. There are counter poses and a lot of variations. 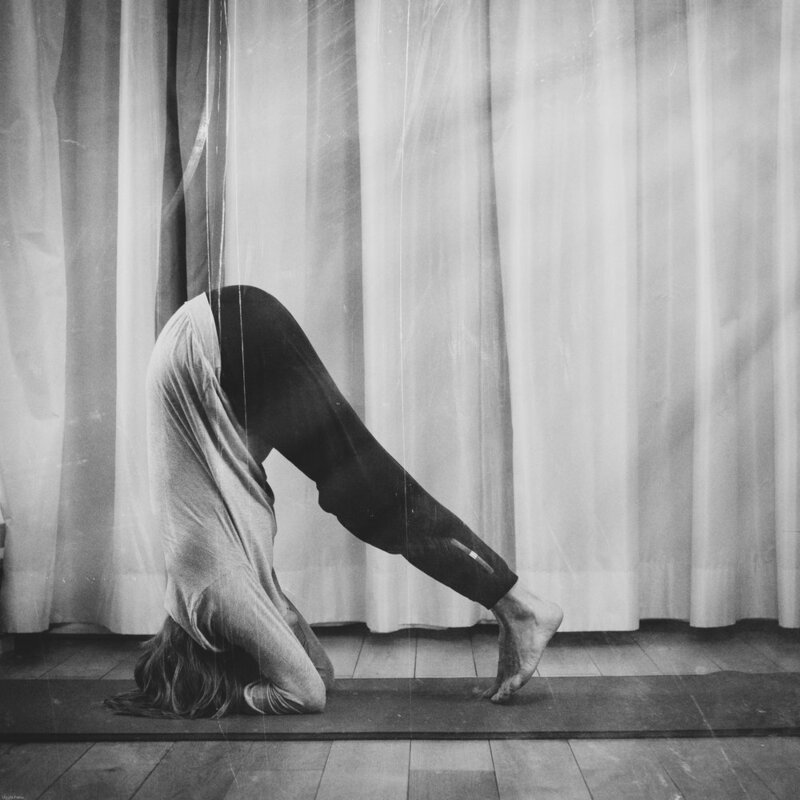 Experimenting helps to make your yoga practice to your own practice. Make your own experiences. Create your own stories. Enjoy. I’m slightly overstretched today. Perhaps also not so slightly, but overstretched. The back of my legs complain when I bow forward with straight legs. These injuries are inevitable if the breaks between practices are too long. My experience is that a break of more than three days or even a week or longer is too long. The mind still knows what was possible the last time when I practiced, yet the body adjusted already to another life style and got stiff. During a practice it’s almost impossible to realize if one goes too far. The pain comes the next day or even later. It’s the same with sore muscles. When I practiced daily I’ve been never overstretched. A daily practice is the solution if one want so avoid getting overstretched. The next question is how to avoid breaks. My experience is that yoga must come first. Sometimes I have so much to do that I start working on these daily tasks first. Duties first, I think. But every task lasts longer than estimated. I accomplish a lot on those days when I postpone yoga. But often yoga is not only postponed but cancelled on those days when I switch my priorities. After lunch my stomach is too full for a practice and in the evening I’m often too tired. What is more important than my health, my well-being? Nothing. This is why yoga must come first. The plan is to finish my practice before lunch time. Of course exceptions exist: Serious injuries like my SI injury might require to stop practicing for a while. Sometimes other activities must get priority. Yoginis are flexible, aren’t they? To discuss every day what comes first is surely not a good idea. Just doing it without discussion is a trick to start practicing. I’m looking forward to my practice today. Slowly I’ll bow forward. My body will tell me it’s limits of today. These days I set an end to my practice. Instead of planning to practice primary or second series or half primary and second series asanas, I set a timer. Not the contents, but the time limits my practice. This is somehow easier. Within 90 minutes one can do a lot. Quality over quantity! Might be that I extend the length of my practices again one day again, but right now it seems to be a perfect length. Today my mobile phone wrong when I had finished the back bending asanas. Extra exercises and my slow speed cause that 90 minutes is too short for a full second Ashtanga series. Who cares? I observe what is possible on a given day. No matter if I felt stiff or weak or flexible and strong, I’m more than happy that I can do this practice. When discomfort is felt, it’s a sigh that one touched limits. It gives the opportunity to go a tiny step further. It gives the opportunity to breathe and to relax to feel good at the rim of the possibility. Pain tolerance changes every day like everything else, too. To practice 90 minutes without interruption tells me that my concentration is very good. It’s the illness of the time that people cannot focus anymore. The mobile phones distract most people. I even think that it has the potential to weaken our brain. In yoga we care for our bodies, but we also take care of our mind. Being able to focus is a skill of the mind. It’s worth to exercise it. A timer is a useful tool. One can limit the practice without getting nervous about the time. Sometimes half an hour might be enough. The timer helps to allow me to focus within that time frame. It’s a good idea to hold asanas longer than 5 breaths. To get an impulse from the outside is more effective than to tell oneself when to stop. Also here a timer can make sense. It’s easier to set a timer for 1 minute than to count 15 breaths. One can also use a timer to focus i.e. 20 minutes on back bending within the 90 minutes. I have to timer: my mobile phone and another one. Getting an impulse from outside helps to free the mind from additional tasks. It intensifies the focus. It’s carnival here, it’s the last day and it’s really funny to go downtown to see all the masks. We won’t have much time for carnival today. It’s also not really my circus. We don’t drink, we don’t masquerade, it is as if we just landed from another star. I had a highlight already: My yoga practice. Being a yogi is a life style, I experience this again and again. Today I was curious how the back bending asanas would look. They always feel intensive. What I realize is that I have a starting point that is motivating. Not everything is lost. The above pose was possible after many many repetitions. Today was my back bending day. Also my wheel helped me to get deeper and deeper into back bending poses. 90 minutes were over very fast. 90 minutes is enough. I try to fill this time with exercises that make sense. Quality over quantity. The classic exercise is to lift up and to hold urdhva dhanurasna for 5 breaths. Then one lowers the head to the floor. The hands walk to the feet. and again the arms stretch and lift the body into urdhva dhanurasana. I think this is a good start. In order to get stronger one can lift up as often as possible. One can do 3 sets of this. It can also be useful to aim for holding this pose for 1 minute. The body needs time to stretch. Last but not least urdhva dhanurasana is a pose that stretches the body backwards. Urdhva dhanurasana is an asana that Ashtangis practice every day. After the twists of the second series the time was over. I was strong. Focus is on ‘was’. Today I practiced primary. The plan was to do all the vinyasas. I’m too weak for this these days. I couldn’t even fake myself through this dynamic movement between the asanas. I’m relaxed. It will take some time to get stronger, but it’s possible. Most important is that I can practice without back pain. I was so much stronger than I’m now, but I was never strong enough for some poses. Strength training will help me to perform the vinyasas. It will make my practice easier. Today I reached my limits. Last week I bought these grips. They shall support my effort to master the vinyasas one day. The first step is to lift myself up with straight legs and with crossed legs. To hold this position for 10 breaths is demanding. Then I can aim for swinging forwards and backwards……..
My practice must have priority again. All the other tasks that rise every day, don’t run away from me. They stick like glue. They don’t disappear in the evening like the sun. They can wait at least a bit. Tomorrow I’ll focus on back bending again. I’m looking forward to my practice. This morning I got up at 7 am. The alarm clock woke me up. It was so cold in the hotel room. Even after the shower and the hot coffee I felt icy. I couldn’t convince myself to put on yoga clothes. They are all designed for hot yoga schools and hot mornings in India. It became warmer and warmer during the day. It was too late for my practice. One of the main reasons why I skip a yoga practice is the cold. It’s too cold in here I often think. I cannot stretch. I shiver. I also fear to injure myself when it’s so cold. In addition the body is stiff then. I consider to buy clothes that might keep me warm when I practice on cold days. Not all asanas might be possible with thick and warm clothes, but I could at least do some not so intensive stretches and strength training..